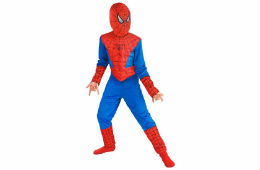 Spider man superhero costume The costume consists of trousers, top and hood (not mask) with eye holes Age Group: 5 -7 Years Quality: Good for 1 to 2 uses. Transparent Cloth. Note: Do not wash this dress.